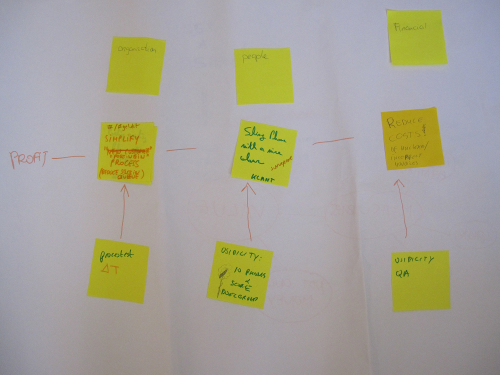 Portia Tung and I ran the “Agreeing on Business Value” session at the Mini XP Days Benelux 2011 conference. In the workshop participants have to create a “Business Value Model” for a case we provided. The Business Value Model shows the most important goals and measures of the company and the relationships between goals. 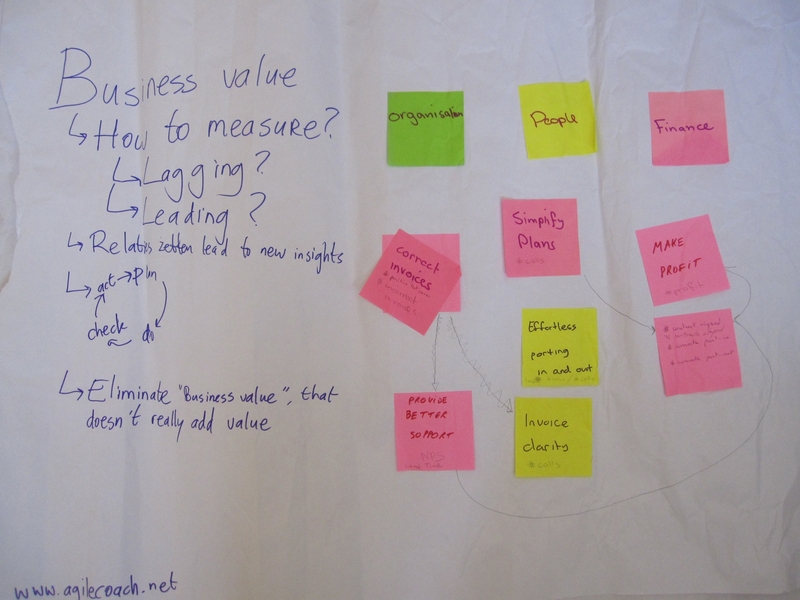 We often run this workshop to let a team come up with a common definition of “Business Value”. As a result of the workshop, everybody’s has a clear and common understanding of the value the project or product is going to deliver. 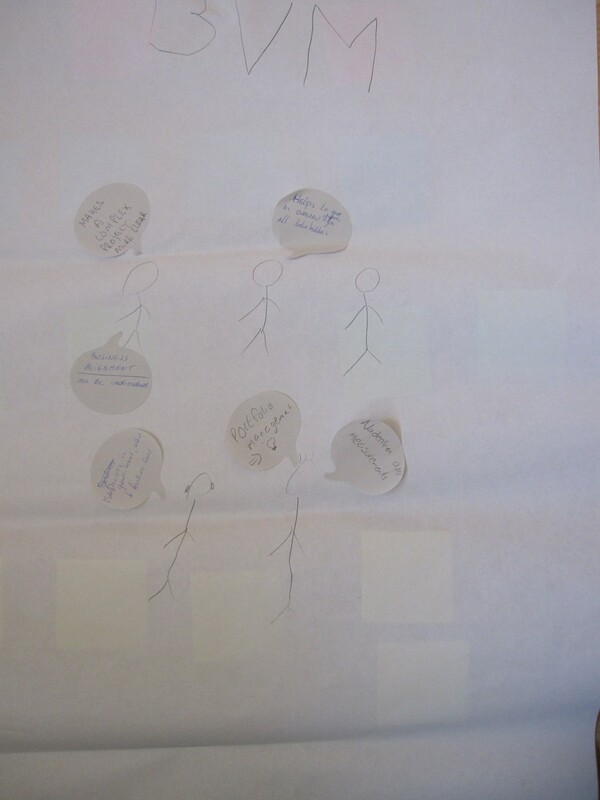 We asked the teams to add what they learned at the workshop on the posters. Here’s a gallery of the outputs of different groups. Click on the images to get a larger picture. In the model different types of goals have different colors: financial goals are blue, organisation goals are green and people goals are yellow. At the top are the “lagging measures” (those that can only be measure late). 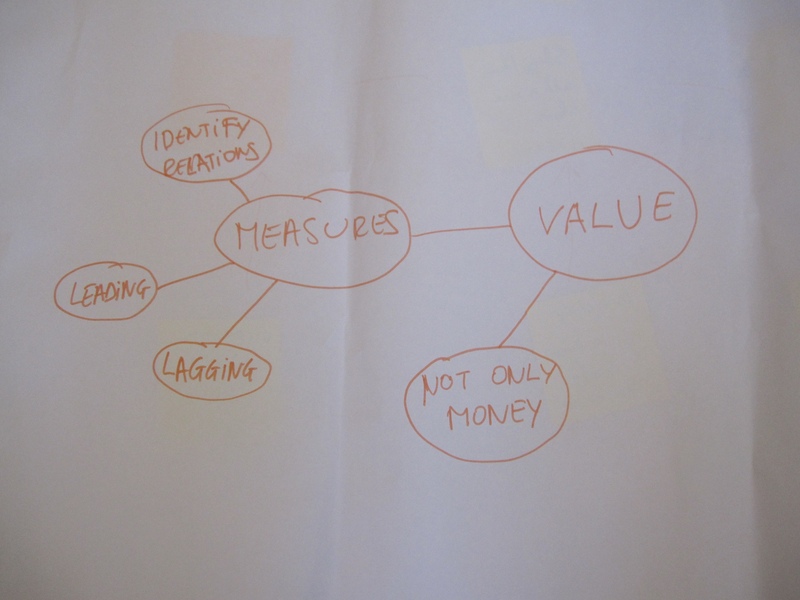 At the bottom are the “leading measures” (that can be measured early) that will be used to predict the achievement of the desired lagging goals. Arrows indicate that one goal has an effect on another. You’ll see that most things are interrelated. 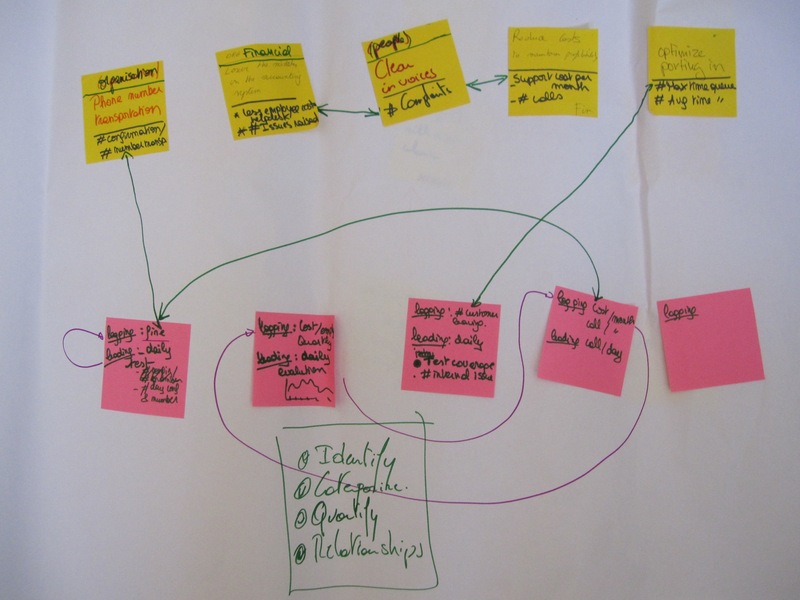 The good news is that achieving one goal can help achieve other goals in reinforcing loops. The bad news is that you may have to achieve many subgoals to achieve your desired goals. (You can use this for) portfolio management! This model has exactly one leading and one lagging indicator per area. Together, the goals result in profit. This team considered more lagging (yellow) and leading (pink) goals. Many of the goals have more than one possible measurement. If you have multiple ways to measure a goal you can choose the cheapest measure to collect or find some data that’s already being collected. We started by describing and drawing the company vision on the whiteboard. Most teams quickly lost sight of the vision. 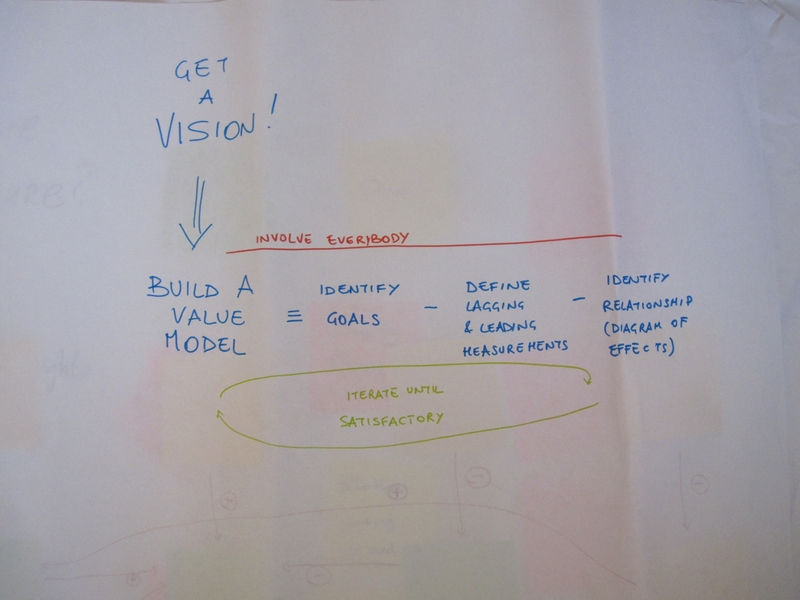 Once they “rediscovered” the vision, they found that it answered some questions about value and priority. It would be good to remind people of the vision before every turn. Maybe we could do this in our work too? 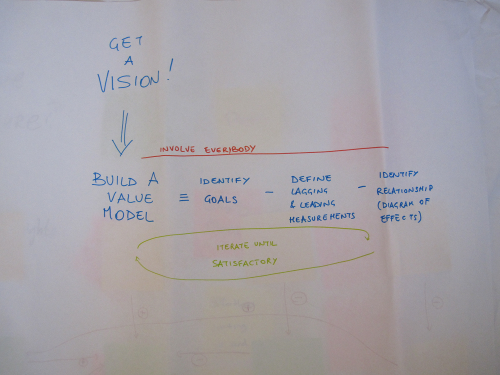 Why not start each project meeting with a reminder of the vision? 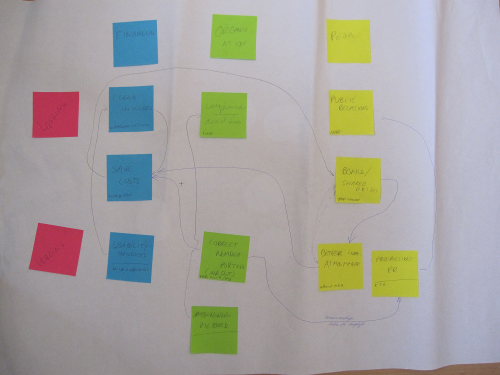 If you want to know more, head on over to the agilecoach.net site where you’ll find more about Business Value Modeling and some other useful tools. If you applied any of these techniques, let us know how it went.